Silver bracelet has Sterling Silver spacers, chain, clasp and features a 925 Sterling Angel Wing Charm. Gold bracelet has 14k Gold Filled spacers, chain and clasp and features a 24k Gold Vermeil Angel Wing Charm. Experience the wisdom, knowledge and learning of Archangel Uriel! These Swarovski crystals and angel wing charm have been energetically cleared and infused with sacred energies to become your direct link to the divine energies of Archangel Uriel. Uriel means “God is My Light.” He is the archangel of wisdom. He is the element of earth and the direction of the North. His colors are purple and yellow for learning. He comes to assist with intellectual pursuits and understanding. Uriel’s assistance with answers and intellect is depicted by his open hand holding a flame, scroll or book to illuminate the mind. He assists with resolving conflicts and problems, and to spark creativity. Call on Uriel whenever you need help understanding or remembering. He will download your mind with information, ideas and insights. He also brings unconditional forgiveness to humanity. In our shift of consciousness he is bringing us the insights of self-forgiveness and forgiveness of others as this is key to every area of our lives. He helps us to transmute lower vibrational energies into enlightened spiritual understanding, and helps us to see past judgment and anger. Ask him to guide you in life’s lessons, spiritual development and growth, and in handling responsibilities in your life. 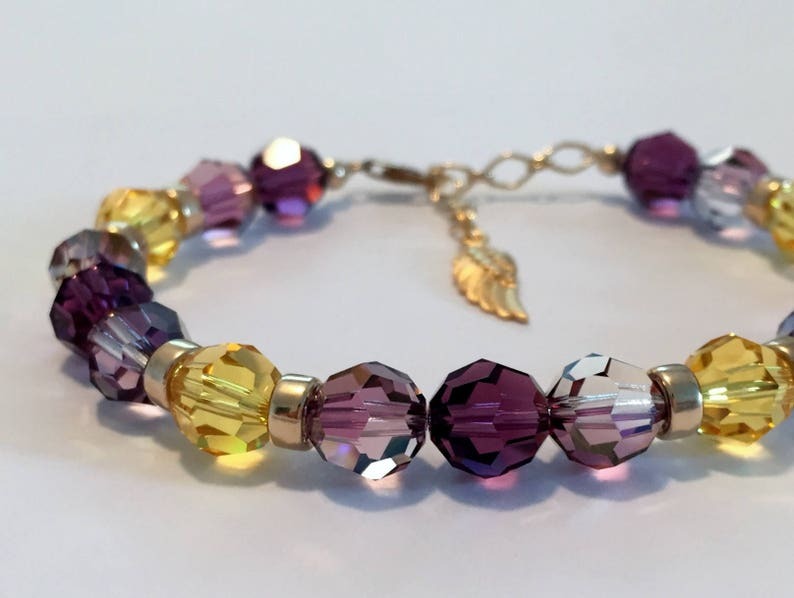 This bracelet has been programmed to adapt to your individual needs, and will continuously receive unlimited sacred energy from Archangel Uriel. The energy will never “wear out,” and the bracelet will not absorb any negative energy, so it will never need to be energetically cleared. If at any time in your journey, you are sensing or knowing that you are not experiencing all that is possible, you can choose in every moment to release the blockages and allow yourself to receive. PLEASE NOTE: We are co-creators with Archangel Uriel in the production of these jewels. We clear, assemble and infuse the bracelets. Archangel Uriel supplies the energy and the blessing. Our intention in creating these jewels is for them to bless and enhance your life. How that manifests for you is in accordance with what you will allow yourself to receive, and between you and Archangel Uriel .